Standoff is a fan-made add-on to Origin's Wing Commander Secret Op. Standoff will work with either the freely-downloadable Secret Ops Starter Package or with the full version of Secret Ops that is included in the Wing Commander Prophecy Gold edition. 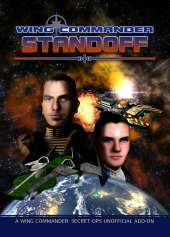 Standoff was originally released in five separate episodes, from December 2004 to August 2009, matching the subdivisions of the game's storyline. As of now, the full game can be installed and played from start to finish by downloading a single file. It takes place during the events described in the novel Wing Commander: Fleet Action, by William R. Forstchen, set between Wing Commander II: Secret Operations 2 and Wing Commander III. After over thirty years at war, the Confederation has accepted a truce proposed by the Kilrathi, and is cutting down heavily on military expenses. Most capital ships are being mothballed, their entire crews discharged from the service. The safety of countless star systems now depends on the few units which are expected to remain operative during peace time. One such unit is the TCS Lionheart, and you, in the role of Captain William Bradshaw, have just been given your first assignment as Wing Commander, in charge of her fighter wing. Features: Over fifty different ships, of which fourteen are flyable; Over fifty missions in a branching campaign; Ten simulator missions directly linked to our online scoreboards; Pre-rendered cutscenes, original music, extensive in-game ficion and over 3000 lines of voiceovers.